I knew that Jarvis Larchmont was an obnoxious adult who had once been an obnoxious child, but when he started coming back to the park after the flood, I assumed that, like everybody else, he was here to enjoy a short respite from city sights, smells, and sounds. As to his camera, I believed its purpose was to photograph flowers, trees, the Children’s Garden, and any or all of our lovely summer blooms. Clearly, I misunderstood his intent. Even so, on some level, I must have realized the significance of his timing. For Jarvis Larchmont came only when Alonso and Hercules Hannah were in the greenhouse having lunch, or during business hours when Esther, Merritt, and Meg were at work. Their absence allowed him the luxury of avoiding a confrontation with the people he annoyed most and who trusted him least. The first time he returned to the Samuel Swerling Park, he strode through the wrought iron gate, his entire demeanor announcing, “I have as much right to be here as anybody else.” Jarvis’s step was quick, his jaw was set, and his eyes were contemptuous. He walked quickly to our biggest climbing tree (not me), and reached for a broad, thick limb with the clear intention of hoisting himself up. I was not the only tree in the park who disliked and distrusted Jarvis Larchmont. The point of a splinter the size of an arrowhead had sunk deep into the fleshy part of his palm. Jarvis wrenched the splinter out, flung it to the ground, and scowled at the tree as though it had deliberately impaled him (it had). Then he kicked the tree’s trunk and stalked out of the park. Jarvis stayed away all weekend. He did not skulk back until Monday afternoon. If he thought that his return had gone unnoticed, he was wrong. I saw him, of course. And so did fourteen-year-old Timothy Wong. Timothy was of the age that grown-ups call “awkward,” a description that at worst is accurate and at best is generous. His parents, immigrants from Hong Kong, had contributed his classic Chinese features, but Timothy’s size, shape, and personality were all his own. His face was a roundish oval, with full cheeks and arched black eyebrows that gave him the look of being perpetually surprised. He was short for his age, but gangly, with feet too large for his skinny legs and ears like butterflies that had landed on either side of his head. But that was months later. Timothy, who was unsure if he wanted to be an anthropologist or a photojournalist when he grew up, decided to combine two of the essay options and show how a person in a place evolves over a week. He arrived in the park at two o’clock on Monday afternoon. Without much interest, he noted sunbathers lounging on benches, couples strolling through the Children’s Garden, and boys and girls climbing or sitting in trees. Then Timothy eyed a tall, thin man with a camera slung around his neck. The man was wearing a short-sleeved beige shirt and khaki slacks. He had a boney jaw and light green. His lips were puffy, and there was no expression at all on a face that he was clearly trying to hide beneath the brim of a fishing hat. At the time that Timothy first encountered Jarvis Larchmont, he did not know that his subject was a city councilman. He was simply attracted to the irony of doing a photo essay on a man who was also taking photographs. In fact, Timothy Wong was so partial to the idea that, in the split second before he snapped his first picture, I heard him murmur, “Mirrors within mirrors,” which wasn’t too far from what he was actually doing. After he took that first shot, Timothy started to follow Jarvis around the park. When the older man stopped to take a picture, Timothy photographed him and whatever he was shooting. If Jarvis took a picture of a boy in a tree, Timothy took a picture of Jarvis, the boy, and the tree – all in the same frame. If Jarvis took a close-up of a twig, Timothy took a long shot of Jarvis, the tree, and the twig. Timothy hoped that the older man would come back the next day, too. On Friday, the last day of Timothy’s research, it rained. Jarvis arrived at the park carrying an umbrella and a powerful mini flashlight. 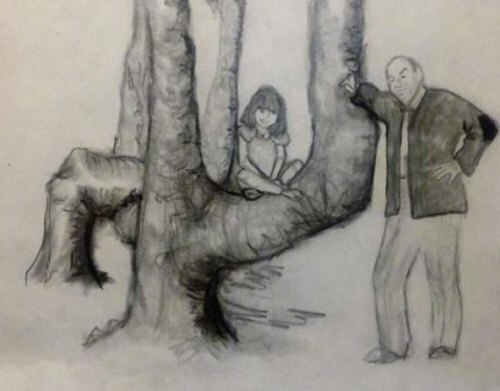 As the high school student trailed behind the city councilman, he noticed that the older man, protected by his umbrella with the flashlight clenched between his teeth, was taking only close-ups – very, very close-up shots – of bark on trees, twigs, sprigs, and roots. These were not, however, of different trees. They were of the same trees that he had shot earlier in the week. “Mirrors within mirrors,” Timothy murmured again as he continued to photograph Jarvis taking pictures of trees. At no time during the week was the city councilman aware that he was being followed. 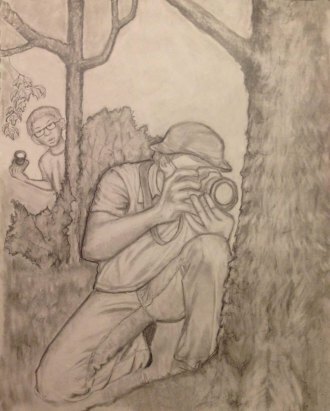 At no time did he realize that a plump-cheeked teen with a red knapsack on his back and bright yellow sneakers on his too big feet, was holding in his hands, not only a camera, but also the combined fates of Jarvis Larchmont, and every single climbing tree in the Samuel Swerling Park.